We use salt every single day, sometimes way too much. Learn why sea salt is a healthier choice for those who like life salty. The next time you pick up that salt shaker at home or in a restaurant, you should think about what's inside. Not all salts are created equal, especially when it comes to your health. There is no question, salty foods are a favorite. Whether we are snacking on potato chips or topping off our favorite dish with it for some extra flavor, we love our salt. The salt most commonly bought and used in the average American household comes from mines. Refined salt is bright white with uniform crystals. After being removed from the mine, the salt is refined and heated to remove minerals and add anti-caking agents. Consuming too much refined salt can lead to health problems like arthritis, gout and urinary stones as well as high blood pressure. Its most common symptom is water retention, which can cause swelling, predominantly in the abdomen. Before you stay away from salt forever, get acquainted with sea salts. When saltwater dries up in the sun, sea salt is left behind, rich in trace minerals. Aside from its role as a flavor enhancer, sea salt can support your health because its minerals can be used in the body as nutrients. Sea salt supports a strong immune system, healthy muscles, nerve stimulation, proper brain function and metabolism. Sea salts are classified according to the region they are harvested from and range in color based on their mineral content. Sea salts have granular crystals varying in size (from very fine to coarse). Two popular sea salts are black and gray. Black sea salt has a strong sulfuric odor and gets its minerals from the volcanic regions of India and Pakistan. Black sea salt is used in Indian cuisine as a seasoning and is popular among vegans for its egg-like flavor. Gray sea salt gets its minerals from clay that lines salt ponds along the Atlantic coast of France. Gray sea salt is collected by hand and is available in fine, velvety grains or in coarse crystals and can also be used for cooking. One of the most popular sea salts is Himalayan pink sea salt, known for its pureness, flavor, health benefits and color. This salt is gathered from sea beds found in the Himalayan Mountains that were covered by lava more than 200 million years ago. Shielded for so long from environmental pollution, this pink salt is believed to be the most natural, purest form of salt. Himalayan pink sea salt is used for culinary and medicinal purposes and is sought out for its quality, flavor and mineral-rich properties. 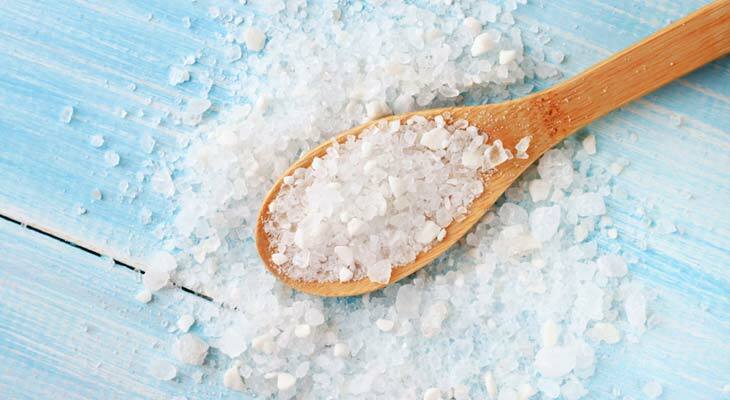 Orally: Whether added to food, consumed directly as a powder or drank as a brine, this sea salt can keep your body's pH balanced to prevent disease. When sprinkled on the tongue or dissolved in a neti pot or inhaler, pink sea salt can help alleviate asthma and sinusitis. Topically: When dissolved in warm bath water, pink sea salt opens up pores, hydrates the skin and improves blood circulation. You can also use it as a body scrub to remove dry, dead skin. Using pink sea salt can improve the symptoms of skin conditions like eczema and psoriasis. Himalayan pink sea salt also promotes weight loss and is a more heart-healthy option. It also acts as a mood enhancer, increases sexual drive, promotes better sleep and helps maintain serotonin and melatonin levels. Just stick to proper dosage instructions. When choosing salts, remember to think colorfully and you'll reap the benefits of adding more sea salt to your diet. This raw pink sea salt is among the purest available, full of minerals vital to our health. This product is also thoroughly inspected to ensure optimal quality and nutritional benefits. Try substituting pink sea salt in the kitchen and feel the difference! Harvested in France by hand, this sea salt contains no additives, giving you all the essential minerals and nutrients not found in refined table salt. Adding Celtic Sea Salt gives food a bold taste you can feel good about.